Globalizing an application is an important part of any development process as it ensures that your product can reach as many people as possible.The RadDataForm control provides a globalization mechanism which you can utilize to expand the reach of your audience and automatically visualize different strings for the headers, groups and placeholders depending on the culture of the device. In the same way as the built-in mechanism for localizing .NET applications uses RESX files and the classes in the System.Resources and System.Globalization namespaces, the RadDataForm control relies on similar setup to achieve the functionality. In order to globalize the visual elements used to represent the properties of RadDataForm's item, you need to set the DataFormLocalizationManager.Manager property to use a custom ResourceManager. This ResourceManager can be obtained through the default resx file which holds a list of key/value pairs. This article will show you how to set up the globalization. Note that the HomeTown property does not use the "key" properties, meaning that the values will stay the same for all cultures/languages. The custom ResourceManager should be set before initializing the RadDataForm component. Eventually, the RadDataForm control will automatically detect the language set to your device and if you have added resource file for that language, it will use the values from it. In case the language is not present in your resources - the values from your default resource file will be used. 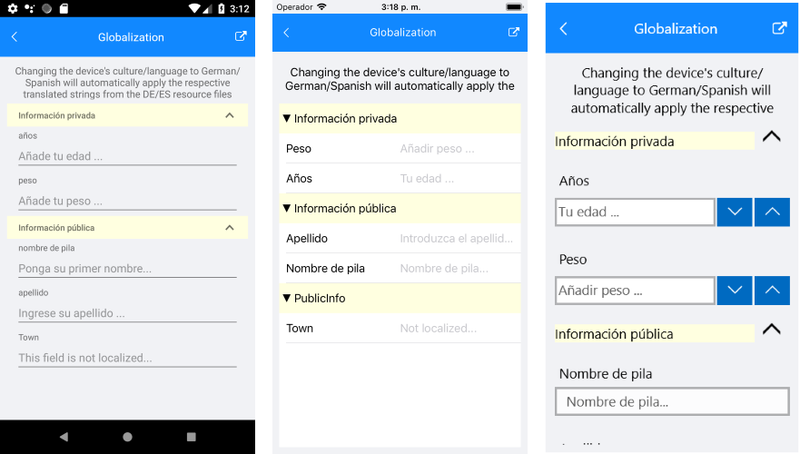 You can find an example on how to globalize the RadDataForm control in the RadDataForm/Globalization section within the SDK Samples Browser(the application is also available in the Examples/Forms folder of your local Telerik UI for Xamarin installation folder).